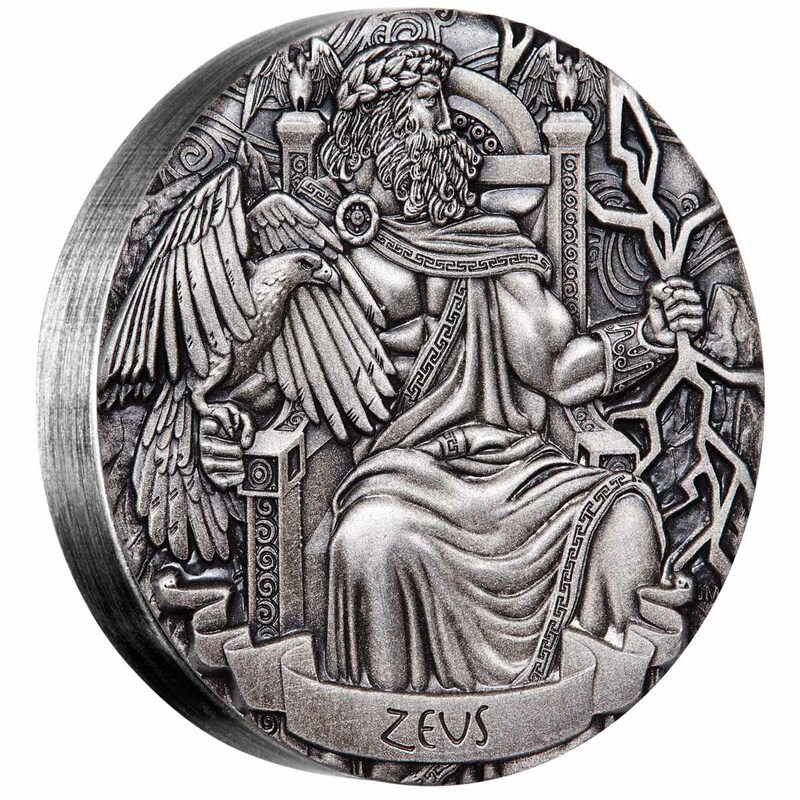 One of the biggest hits of 2014 and a coin that kicked off a the whole modern numismatic trend for antiqued, high-relief ancient mythology, Zeus was the first of the Perth Mints Gods series. 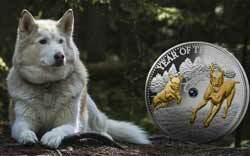 Since its debut, there have been four complete three-coin series and all have sold out. 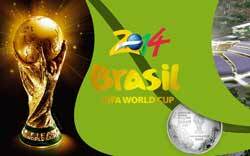 The release today has more than doubled the selection. Going back to the subjects covered in the 2014 and 2015 series, Gods of Olympus takes the same two-ounce format and produces a whole new set of designs. 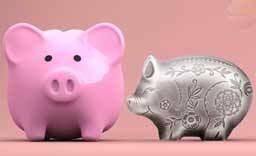 One coin is available individually. 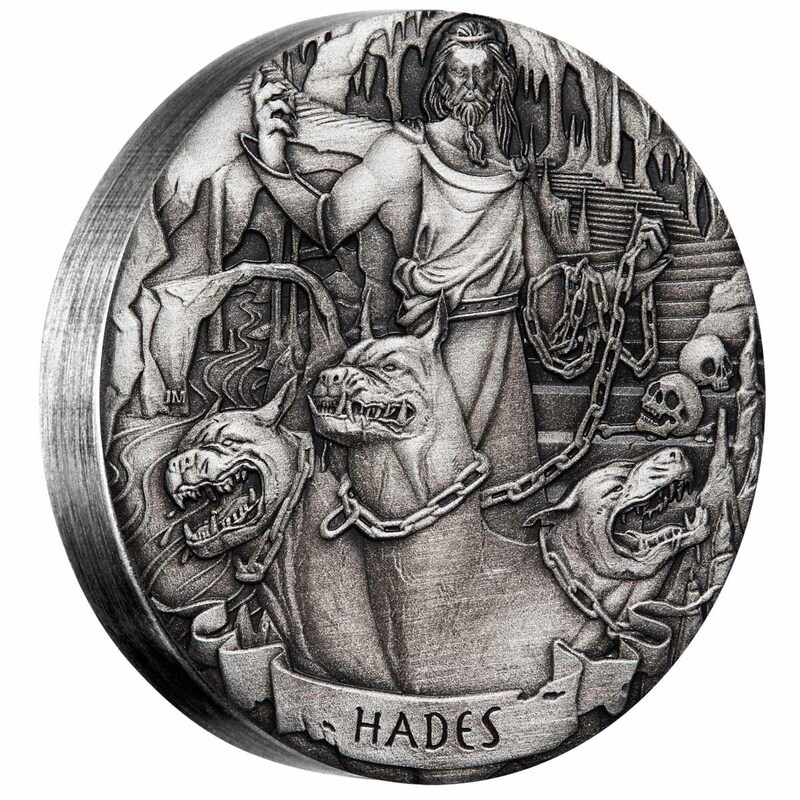 As the only god that inhabits the underworld, Hades stands apart and so does the coin. 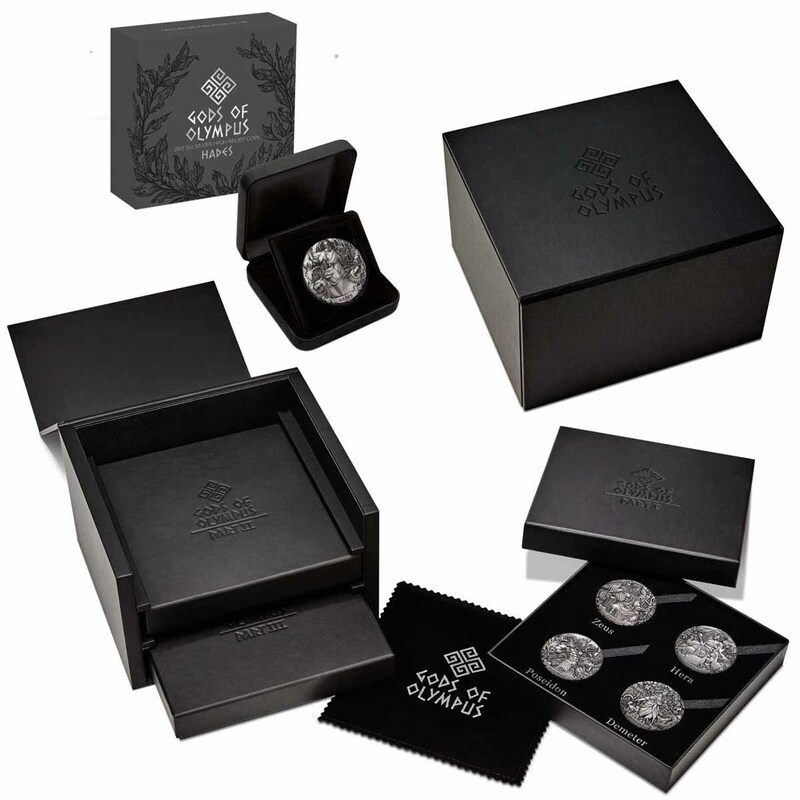 Packaged in a standard Perth mint coin box rather than the exquisite ones the previous coins have enjoyed, it’s a good classic design with a mintage capped at 1,000 pieces. 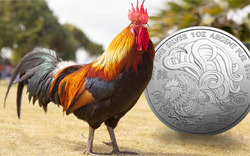 The other twelve coins are only available as a set, which obviously carries its own cost implications. Again limited to 1,000 sets, the twelve designs have the same art style as Hades, which is different to that used on the previous four series – more in a classical style than the stylistic one used previously. 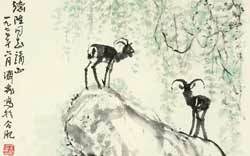 We can see those not enamoured of the originals liking these for that reason. Issued for the Cook Islands instead of Tuvalu, the effigy is the Raphael Maklouf effort, one we prefer here. Beautifully packaged in a three-tray box, it’s a fine package but the cost of entry, well in excess of $2k AUD, means that many will miss out. 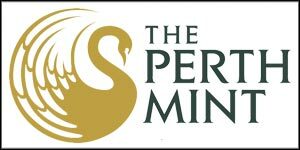 The Perth Mint has a small allocation, but the bulk will be sold by GovMint and MCM in the USA. No doubt that will mean slabbed and graded versions will abound, and the price will rise further. A fine set of designs for those willing and able to splash out, however. 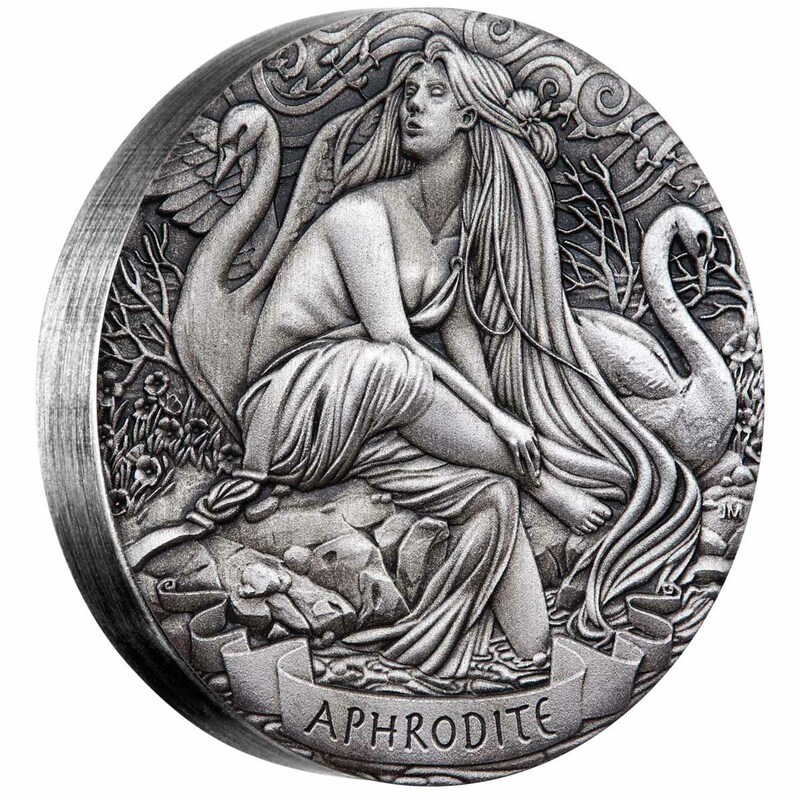 APHRODITE: The reverse of the coin depicts Aphrodite sitting on a rock at the edge of the water with two swans. 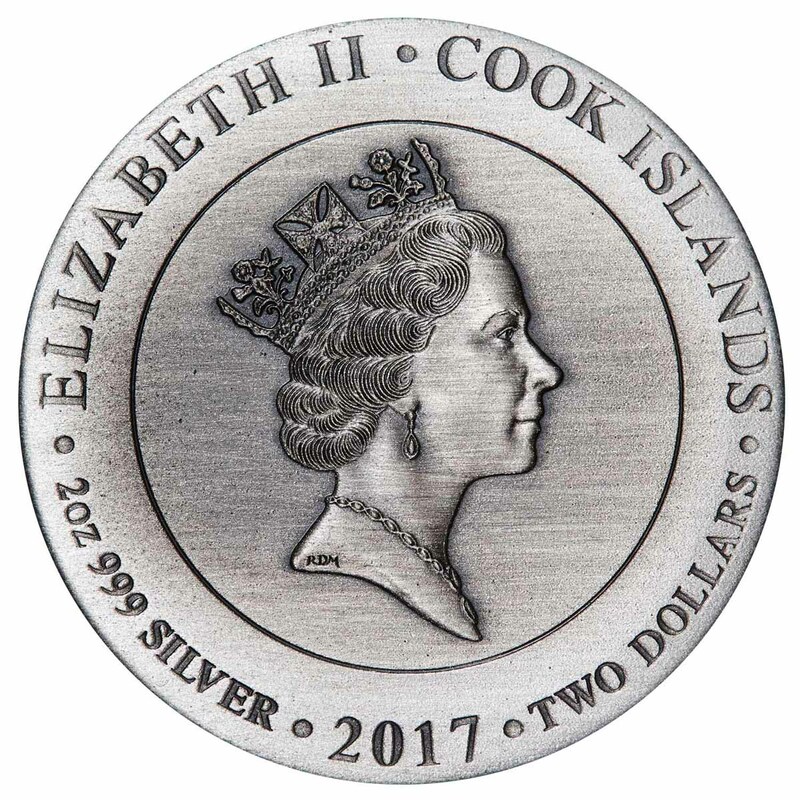 The design also includes the inscription APHRODITE, and The Perth Mint’s ‘P’ mintmark. 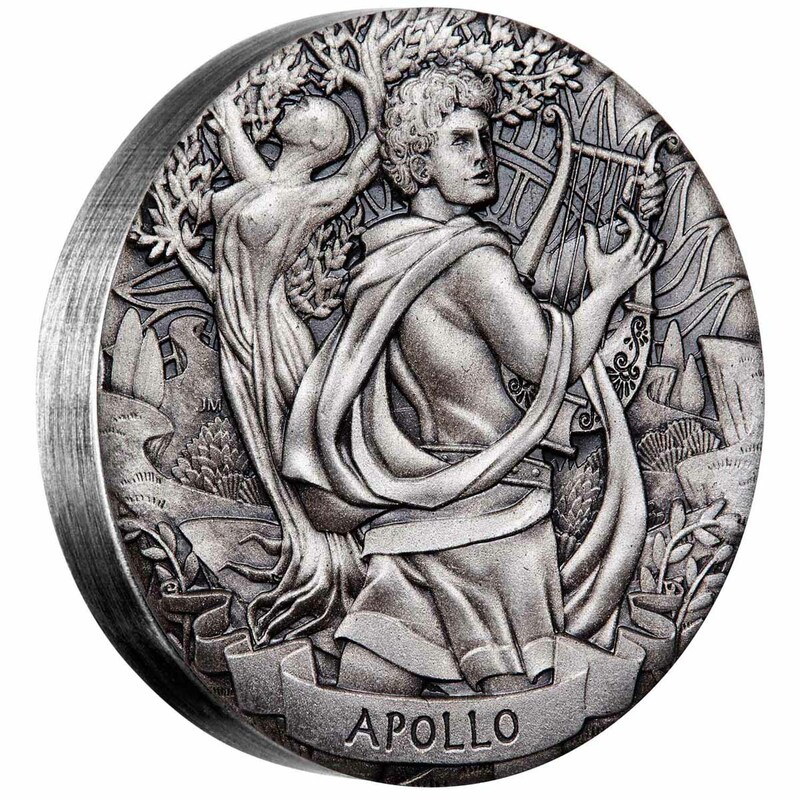 APOLLO: The reverse of the coin depicts Apollo in a garden playing his golden lyre. In the background is the nymph Daphne, transformed into a laurel tree. The inscription APOLLO also appears in the design. 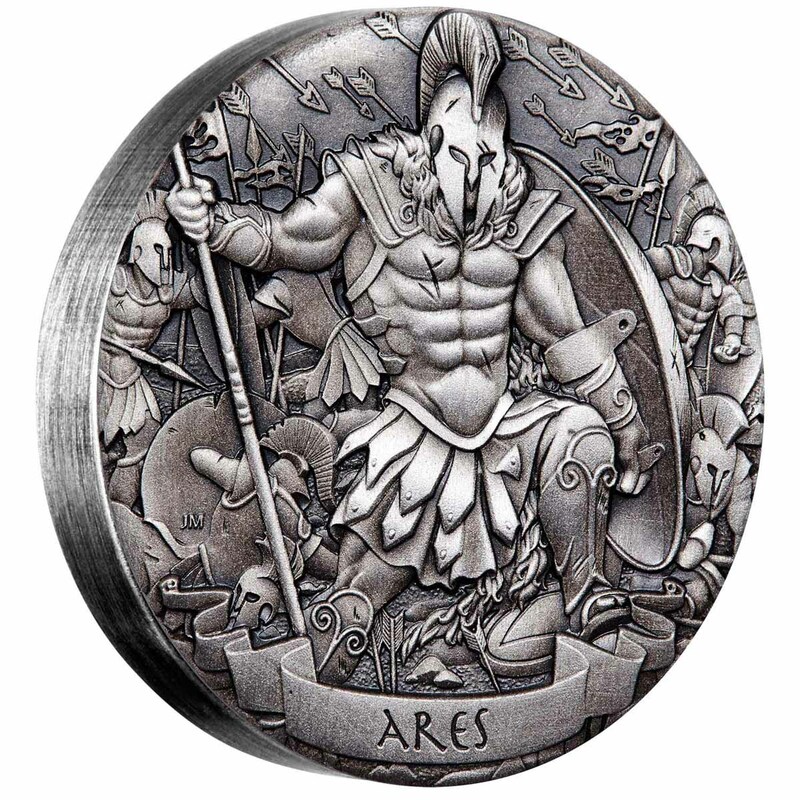 ARES: The reverse of the coin depicts Ares in the midst of a battle wearing full body armour and holding his shield. The inscription ARES also appears in the design. 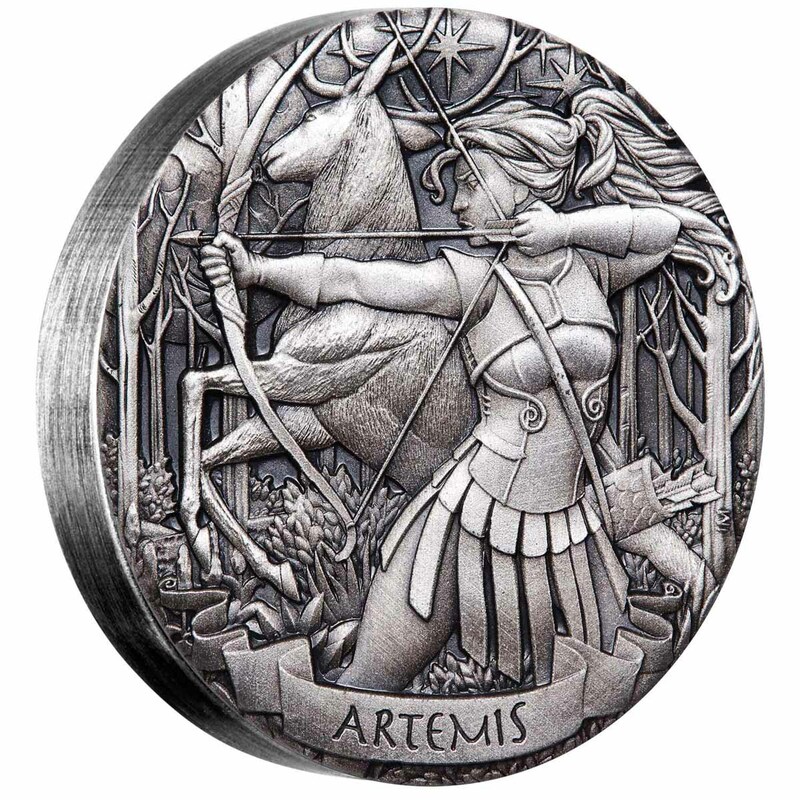 ARTEMIS: The reverse of the coin depicts Artemis in the forest at night time with a full moon and a large stag in the background. She is featured drawing her bow and arrow and aiming into the distance. The inscription ARTEMIS also appears in the design. 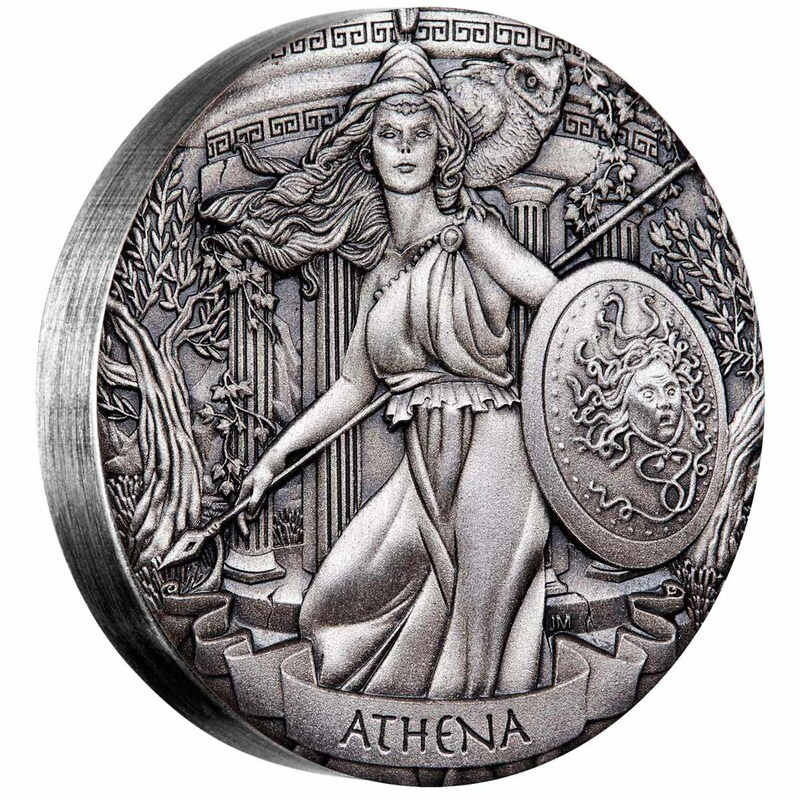 ATHENA: The reverse of the coin depicts Athena in front of a temple surrounded by olive trees. She has an owl perched on her shoulder and she is holding a large spear in her right hand, and a shield with Medusa’s head on it in her left hand. The inscription ATHENA also appears in the design. 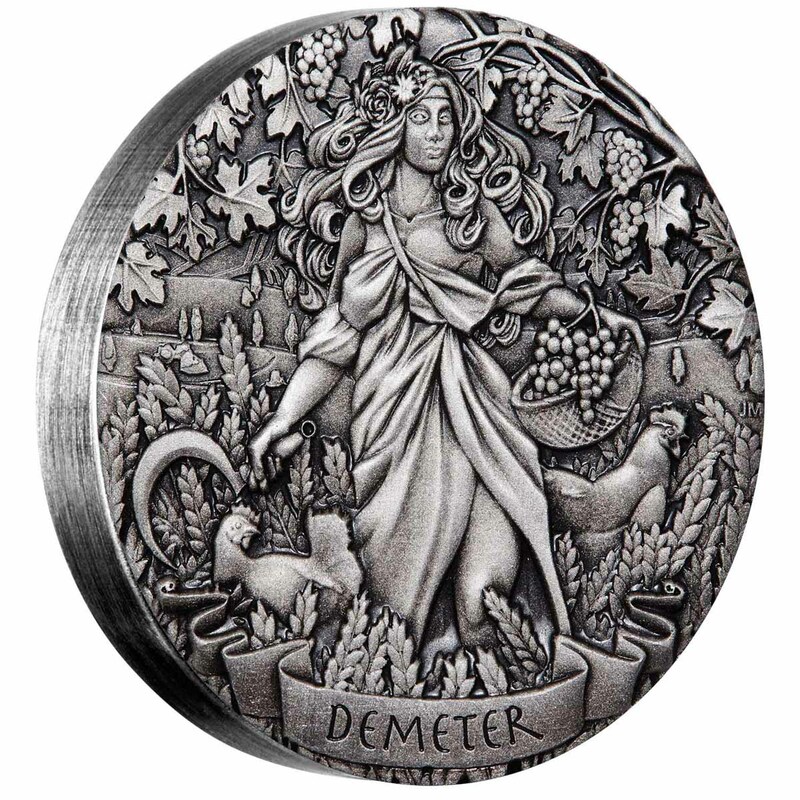 DEMETER: The reverse of the coin depicts Demeter standing in a field surrounded by wheat, with two chickens. She is holding a basket full of grapes and standing under a grape vine. The inscription DEMETER also appears in the design. 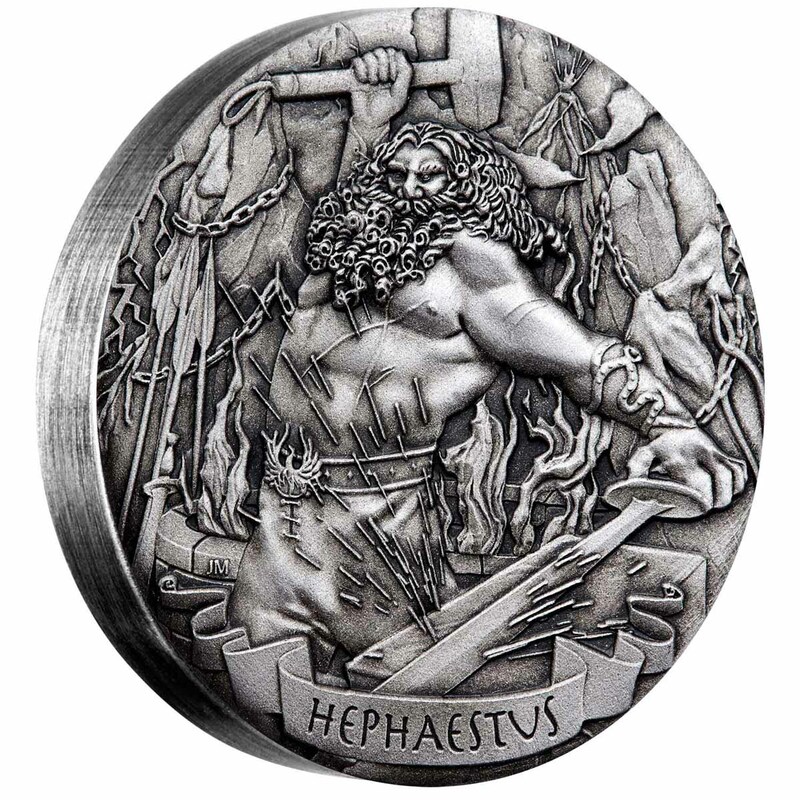 HEPHAESTUS: The reverse of the coin depicts Hephaestus standing in front of a furnace in his workshop wielding a hammer as he prepares to hammer a sword on his anvil. 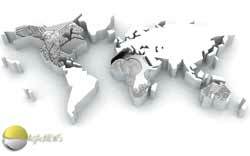 Also included in the design are volcanoes and the inscription HEPHAESTUS. 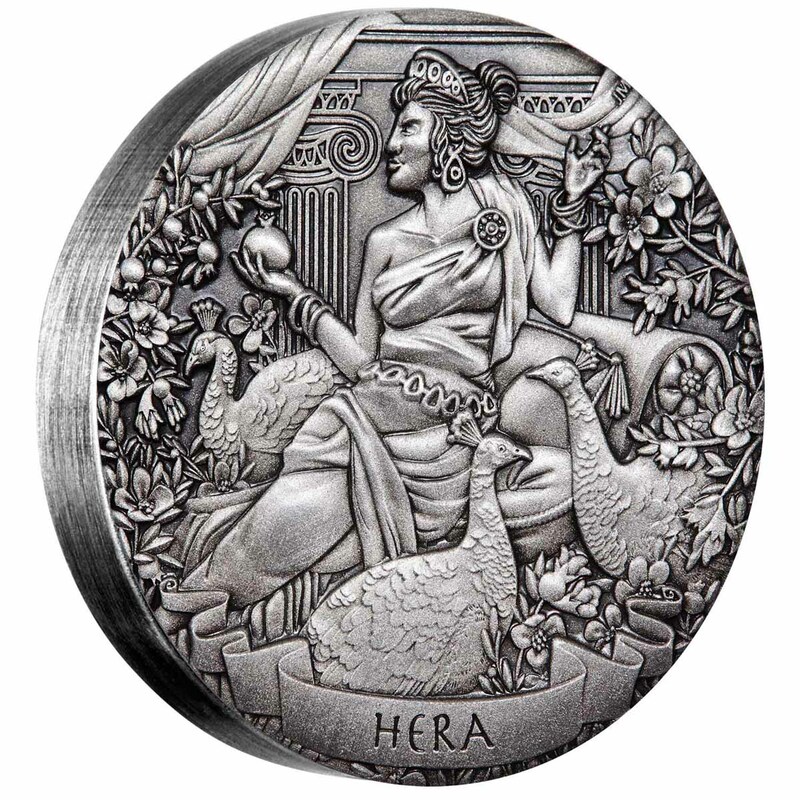 HERA: The reverse of the coin depicts Hera wearing a polos crown, sitting on a throne in the Temple of Hera, holding a pomegranate in her right hand. Hera is pictured with three peacocks. The inscription HERA also appears in the design. 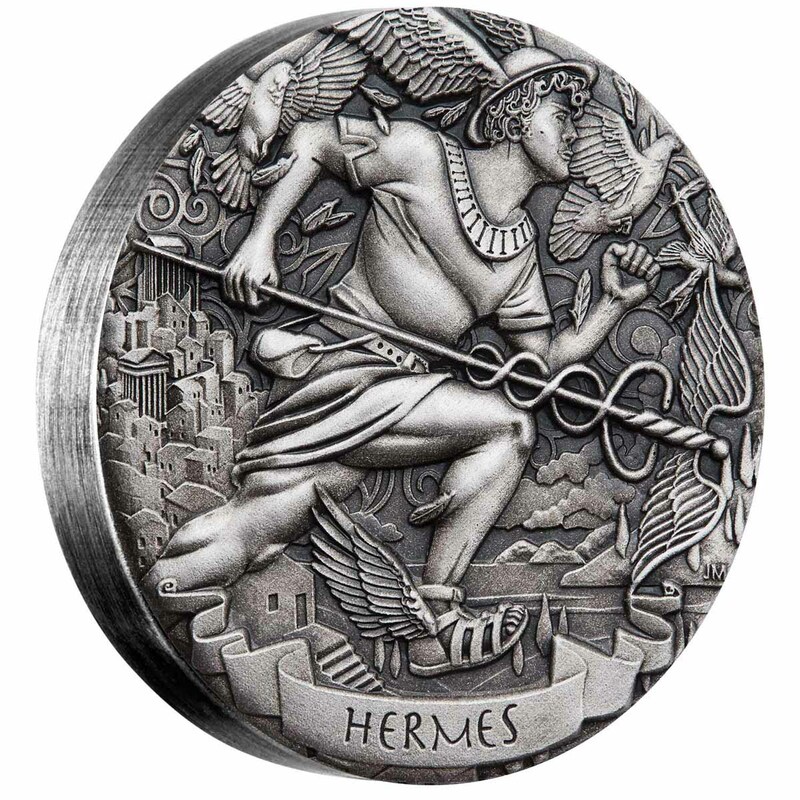 HERMES: The reverse of the coin depicts Hermes running through the sky with an ancient Greek city in the background. 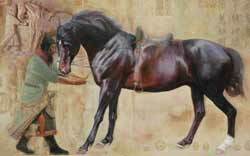 He is carrying his kerykeion and wearing a short robe, his leather messenger pouch, his winged traveller’s hat and his talaria. The design also features several birds flying through the sky and the inscription HERMES. 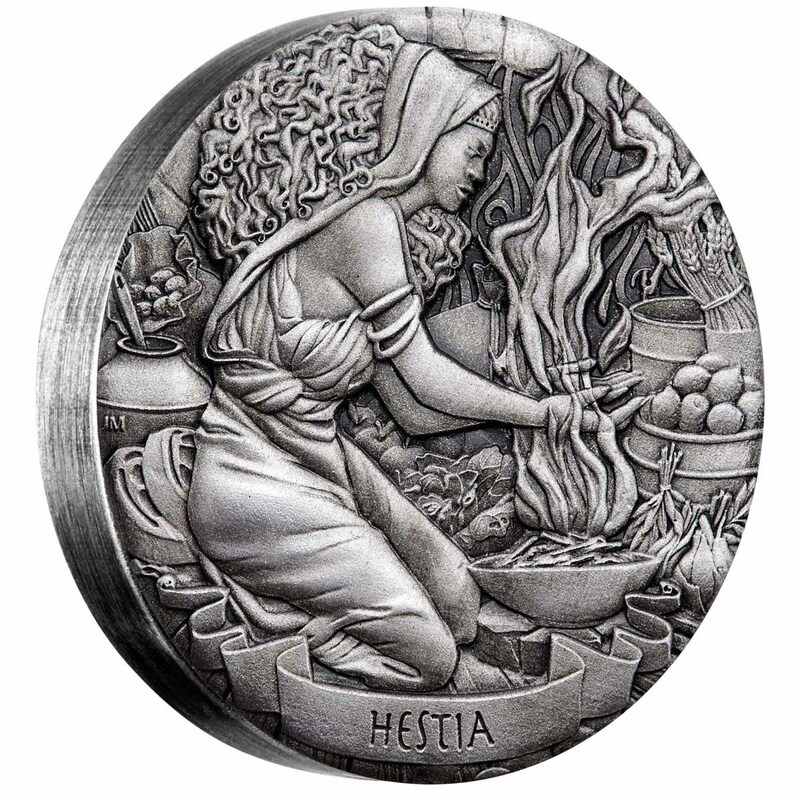 HESTIA: The reverse of the coin depicts Hestia kneeling on a hearth next to a fire in a kitchen surrounded by pots and pans containing a variety of foods. The design includes the inscription HESTIA. 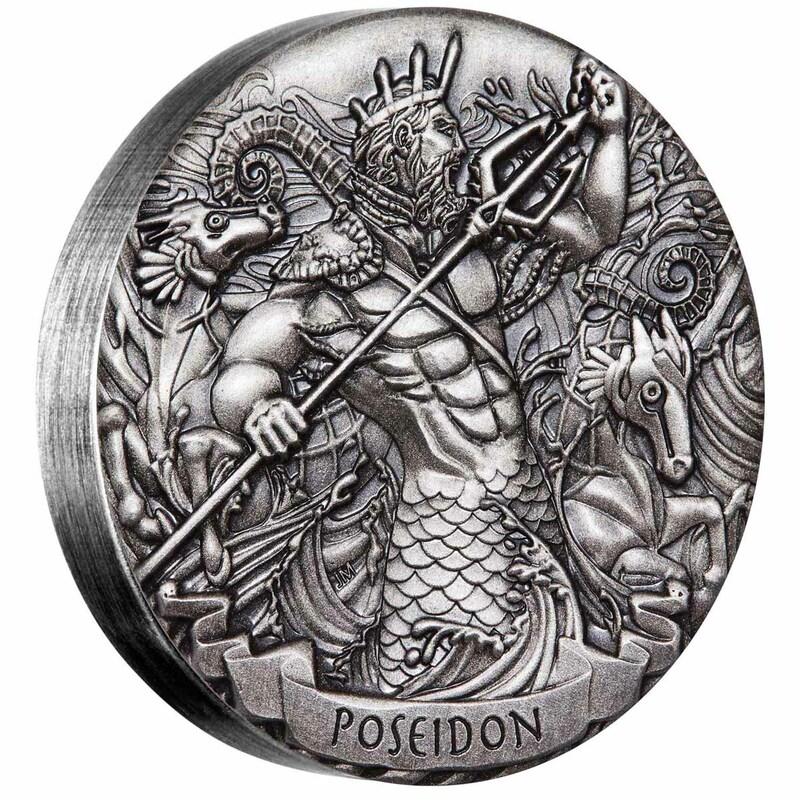 POSEIDON: The reverse of the coin depicts a bearded Poseidon emerging from the waves with his two hippocampi, clutching his trident. 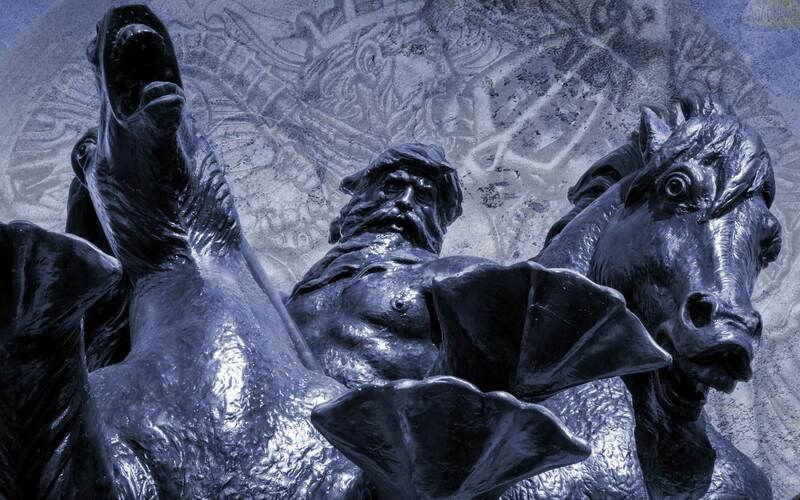 The inscription POSEIDON also appears in the design. ZEUS: The reverse of the coin depicts a bearded Zeus sitting on a throne with an eagle perched on his right hand and a lightning bolt in his left hand. The inscription ZEUS also appears in the design. HADES: The reverse of the coin depicts Hades standing at the bottom of a staircase in the underworld with two skulls in the background. He is holding Cerberus, the three-headed watchdog, by a chain. The inscription HADES also appears in the design.